Is Pilates the New Botox? Everyone everywhere is talking about how to fight the aging process. You can’t read a magazine, attend a party or scroll through an on-line publication without seeing or hearing something about fighting the aging process. We all know about Botox, fillers and magical weight loss supplements. We also know that good skincare and a healthy diet can help fight aging and make us look and feel younger. However, does anyone realize that Pilates also fights the aging process and doesn’t require needles or expensive creams? If you think about what makes a person look older you first think about is wrinkles, saggy skin and gray hair. Yet poor posture also makes people look older. The pain and discomfort caused by poor posture is a factor in making people appear older. Look around you and see how being stooped and rounded detracts from one’s appearance. A 70 year old who stands tall and erect with a graceful gait, can look as much as 15 years younger. After studying twins, researchers discovered that those who exercised regularly aged better than their biological twin. This shows that there is more to a healthy and fit body than just DNA. Pilates may be one of the best anti-aging exercise programs because it addresses so many aspects of fitness. 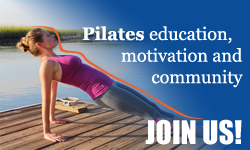 Note from PB: The research about the effects of Pilates on posture is still limited but several studies have found Pilates to be effective for correcting hyperkyphosis in both young and older adults. Most of the studies are limited to only 8-12 weeks and this time is not even nearly enough to see posture improvements in Pilates students. Consistency is the most important ingredient in the Pilates anti-aging cocktail. To address an anti-aging program to the Pilates repertoire, it is crucial to focus on increased muscle strength, flexibility training, postural exercises and balance. Here are a few exercises in each category that I do with my clients to keep them looking young and healthy. Of course not every client can do every exercise listed nor is every exercise listed, but find what works best give your client’s health and background. Make sure to address at least one exercise from each category. Muscle Strength: On the reformer or Cadillac Table arm work with relatively heavy resistance for arm arcs, arm circles, triceps and rowing. Pulling straps 1 and 2 for arms and back and chest presses on the long box. Flexibility: Short and long Spine, all splits, feet in straps. Ballet Stretches on Cadillac. Elephant. Posture: Rowing, Pulling Straps, Footwork on Wunda Chair. Balance: Splits hands free, standing Wunda Chair work. About the Author: Devra Swiger is a Polestar certified Pilates instructor, ACE Orthopedic Fitness specialist and ACE certified Personal Trainer and Group Fitness instructor. She has studied with Colleen Glen, Jennifer Kries and many other top-tier instructors. She owns Ab-Solutely Pilates in Huntington Beach, CA. In addition to Pilates, Devra loves hiking, yoga, learning foreign languages and painting. She can be reached at WWW.Ab-Pilates.com. I am 68 years old and currently living in the Middle East looking after my 3 grandchildren on a full time basis. Being an expat community, many grandparents visit and can be spotted at pick up time etc. and one day the eldest boy, 11 yrs, said ‘Why don’t you look like a grannie?’ After enquiring what a grannie looks like, he said ‘well, you know, small, slow, short grey hair’. I am 5’8″ and also climb over neighbouring passengers and besides my Pilates practice, I swim 2 km 3 x week (continually scanning my body for my Pilates alignment) and am kept on the go by the 3 boys. I owe my new gait specifically to Pilates – I cant believe how bad my original alignment and by extension my functional walking and running movements were before Pilates. That is my mission now, to assist my Pilates students, whatever age, to understand the connection between alignment and correct functional movement, besides the added benefits of strength and flexibility. What an amazing story! I truly believe that! Most of the ladies in my classes are 40-80 years old. Sometimes we get the younger generations, but most of them are so into heavy cardio, but that’s ok..
As they injure themselves, they often come to me for advice…. We used a very “deflated” Overball. Pilates is LIFE! Better than Botox! In my 30’s doctors who looked at my cervical spine x-rays without seeing me always walked into the examining room shocked. They thought I would be at least 75 years old. Finally in 2010 at the age of 54 I had C 3,4,5,6 replaced with cadaver bones. The day after surgery I could was so happy! I need to preface this with the many integrative approaches I used to improve my quality of life. Besides medication, there was yoga, tai chi, adjustments, massage, injections, etc. I have had migraines for over 50 years. At age 58 Club Pilates opened in my area . I was one of the early clients. I am just shy of 61 and am hooked! I have attended class two – five times a week depending on my schedule. I started with 3 lb. weights, moving to five, eight and now ten. I am stronger than I have ever been, more confident, I gained a half inch of the inch I lost from my surgery. My posture which I have always been aware of, comes naturally because my core is stronger. I find myself doing “Pilates” breathing when watching a tense movie with my family. I have gone on and on and could go on more, thank you Pilates for being what I will not give up! At almost 59 I teach and practice Pilates..both mat and full equipment. I have never felt better nor had such a healthy balanced body. Many of my clients agree..Pilates is a fountain of youth! You are only as old as your spine! So true? I am turning 60 in one month and had been practicing it for 4 years when I decided to become a teacher. I have been teaching Pilates for 4 years now and feel so much younger! My posture too has improved and I believe I will be practicing Pilates for the rest of my life.